The writer is a senior journalist based in New Delhi. The democratic institutions of Bangladesh have been eroded for short-term gains by those in power for a long time. The first two international calls to congratulate Sheikh Hasina Wajed for her landslide win in the Bangladesh polls came from India and China. 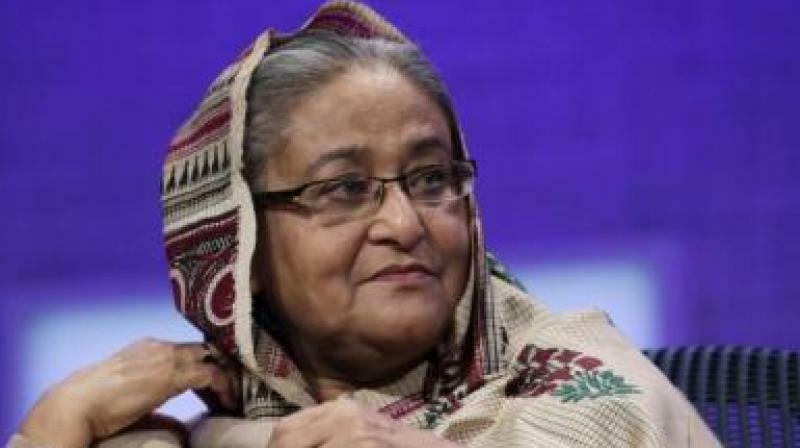 The rest of the world has been more circumspect - wary of a poll result in which Sheikh Hasina has incredulously bettered her record of 2014 when the Opposition had boycotted the election. The West has chosen instead to express concern over violence, intimidation and harassment of political opponents before the election. The Bangladesh election results are neither going to further democracy in that country nor India’s long-term interests in South Asia, and beyond. The Bangladesh Opposition - primarily the Bangladesh Nationalist Party (BNP) and others which came together as the National Unity Front - has rejected the election results. However, the demand for a fresh election is unlikely to be conceded by the Election Commission, which is described as partisan by the Opposition. Sheikh Hasina wears the badge of development but the system she presides over has functioned with intimidation, intolerance and fear. Over time, this has muted critical voices and narrowed the democratic discourse. After the Awami League’s massive, yet questionable, victory, the democratic space can only shrink. Hundreds of political adversaries, including Bangladesh Nationalist Party leader Begum Khaleda Zia, are already in jail. The Opposition will be further decimated as those who escaped prosecution so far may be jailed in the coming days. Fear of the State’s coercive machinery will stymie public protests against the government. The democratic institutions of Bangladesh have been eroded for short-term gains by those in power for a long time. Both the outgoing Parliament and the incoming Parliament are good examples. The former was unrepresentative because the Opposition boycotted the general election and the latter will be also perceived to be so because of the allegations of match-fixing. Due to political manipulation by the State, the judiciary and the Election Commission have also lost their sheen in the country. The media has fallen in line with state diktats. Given a history of attacks by both state and non-state actors, public intellectuals and independent bloggers fear for their lives. The absence of democratic safety valves and with institutions of the state “weaponsied” against dissent, is a particularly dangerous situation for countries which have a significant presence of Islamic radicals. The failure of political processes creates a fertile ground for the expansion of radical politics. The people can then easily turn to Islamic radicalism, as happened in Egypt and Algeria. The prospect of a radicalised Bangladesh is one of the reasons why the developments in that country may not be in the long-term interests of India. There are other reasons as well. Although China and India both welcomed the political continuity in Bangladesh, their stakes are very different. China wants a strategic foothold in Bangladesh to counter the United States, and secondarily, India. Its inroads into the domestic politics of the country through business relations with prominent families of the ruling party can help it advance its strategic goals. The Awami League government has given several entry points to China. Bangladesh is an integral part of the Belt and Road Initiative (BRI). Of the six BRI corridors — four land and two maritime — Bangladesh is an integral part of the important maritime corridor running from Kunming to Kolkata through Myanmar’s Kaukpyu Port to Chittagong in Bangladesh and on to Kolkata. Apart from opportunities for trade and commerce, this gives China access to the Bay of Bengal and the Indian Ocean. The Kaukpyu Port, with 85 per cent Chinese ownership, will be an energy hub, designed to overcome its dependence on the vulnerable Malacca Straits for 80 per cent of its oil imports from the Middle East. The Kaukpyu port will store the crude imported from the Middle East and process it at a refinery being built by the Saudis, a methane refinery will be built by Qatar to treat gas imported from Qatar and all the products along with Myanmar’s Shwe gas field will be pumped through pipelines to China. The BRI connecting deep-sea port at Sonadia near Cox’s Bazar is currently on hold. China wants continuity in Dhaka to protect its geo-strategic, geo-economic and geo-energy interests as well as its investments in big infrastructure projects like the Padma Bridge, the Chittagong Highway project and the 13,500-MW Moheshkhali Power Station. China fears a repetition of what happened in Malaysia when the new government of Mahathir Mohamed put on hold the Chinese $1.5 billion East-West Railway Project. It wants no uncertainties about the $40 billion BRI investment it has committed to Bangladesh. As the bulk of the BRI funds are expected to flow into Bangladesh after the recently-concluded elections, China had an interest in political continuity. China also needs Bangladesh to relocate some industries because of the lower labour costs it offers. Bangladesh could become the preferential entry point for “Chinese¨ goods from Least Developed Countries to the Western markets. Compared to China’s wide spectrum strategic and economic interests in Bangladesh, India’s interests remain small - assurances on denying shelter to the Northeeastern insurgents in Bangladesh; preventing jihadi militancy from crossing over to India; denying Pakistan the opportunity to print and push fake currency into India and preventing illegal immigration. Sheikh Hasina’s government has cooperated with India on these issues in the past and, therefore, New Delhi has supported the continuance of the Awami League. Although the entry of China in Bangladesh had an Indian nod, the Chinese footprint is set to expand over time and India will not have a veto. The Chinese expansion will marginalise the role of both India and the United States. As this great game unfolds, it remains to be seen whether or not Indian interests will get squeezed out of Bangladesh. As for India’s primary bugbear, the rise of Islamic radicals in Bangladesh and its consequences across the border, a one-sided election may have given it a new breath of life. In the long run, it might be easier to deal with a stable and democratic Bangladesh than one that may become a powder keg.